The ugly statistics should dishearten even the most ardent temperance worker. 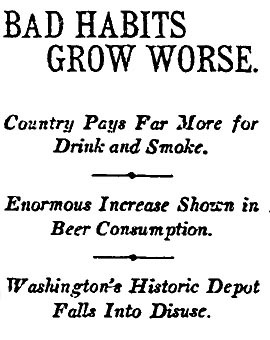 According to federal tax data for the last fiscal year, distillers produced 20 gallons of beer and 1.4 gallons of whiskey for every man, woman and child in America, a 5% increase and 8% increase respectively over 1906. Cigar, cigarette and snuff production also showed similar increases.